Rugby Weekends : We are 6 Nations fans! This is a great place for a group of up to 7 rugby fans to hang out in close proximity to favourite pubs! The world's largest arts festival takes place every August. Edinburgh will completely fill up months in advance, and our very central location is great for visitors and especially companies & festival participants! 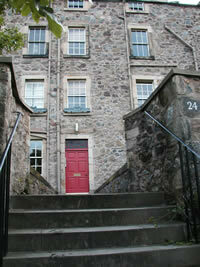 "Unique" is the only way to describe this amazing and charming flat right in the heart of Edinburgh on the ancient monument-studded Calton Hill. 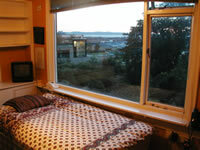 Perfect for visitors to the Edinburgh Festival, Hogmanay (Edinburgh New Year), 6 Nations Rugby, Beltane Fire Festival and any other holiday or short-term rental in Edinburgh Scotland. If you are visiting Edinburgh for the Edinburgh Festival or just on a break, you will appreciate the incredible and convenient location. 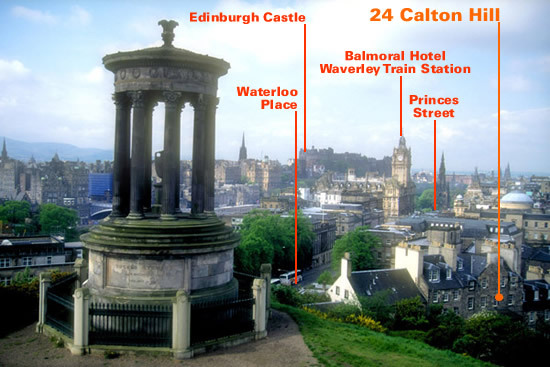 On the slopes of Calton Hill, with beautiful views to the Firth of Forth, you are a 1 minute walk to Princes Street, 2 minutes to the Balmoral Hotel, 5 minutes to Waverly train station, 10 minutes to the new Scottish Parliament. Yet despite its central location, this is on one of Edinburgh's 'hidden' side streets, with none of the city centre traffic or hordes of tourists interrupting your peace. And of course we are experts on the city and will only be too happy to help make you stay a memorable one! Please use the booking form or phone (better) to place a booking. Minimum booking periods apply during the during peak seasons such as Festival and Christmas/Hogmanay. Otherwise there is a 2 night minimum booking. Looking to get away from it all? See our cottage in Moravia, Czech Republic! Home • ©2004 Gordon Howell. All bookings subject to standard terms and conditions.